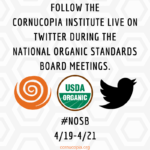 Cornucopia staff members attended the National Organic Standards Board (NOSB) pre-meeting webinar today, where the NOSB heard comments from the public. Cornucopia’s notes from this meeting are below. You can also view our notes from the Tuesday webinar. Michelle from NOP gives some housekeeping comments. Transcripts will be available a couple weeks after the meeting concludes. Paul Lewis officially opens the meeting. This will be Tom Chapman’s last chairing of the webinar; he has been doing it for the last three years. Tom Chapman (Chair of NOSB) also offers some oral comments. Certified organic farmer by VOF. Paper pot transplanter is very helpful tech for a farm his size; often don’t have enough employees to run another kind of transplanter. Takes one person and transplants fast. They are reworking the formula for the paper and this should be given time to develop. Other farms use tons of plastic for weed controls. Baler twine is treated and that’s allowed because there are no alternatives. This is an appropriate technology. Q: When did you found out the paper pots would be discontinued? A: At the beginning of the last growing season, March or April. Q: Explain how the paper pots are helping w/ weed management. A: They don’t help with weed management, they help w/ planting. Can plant 500 plants in two mn, which is laborious by hand. Increased production w/o increasing labor costs. Q: How does it help you not use plastic? A: There is no way you could use plastic with this system; it would be more laborious to use plastic. Plastic is just more unsustainable. Q: Side question about baling twine, do you remove the twine before mulching? A: We remove the twine if we mulch, but most of the hay we sell to horse people. Q: If you have to leave organic certification due to the paper pots issue, would you come back once paper pots are allowed? A: I don’t know. I may switch to another more expensive transplanter rather than give up my organic certification. They produce a liquid fish fertilizer for use in organic growing. Here to address the correct amount of acid used in processing fish fertilizer. Without acid, the product is unusable. Bacteria levels are affected by the acid level (E.coli and salmonella), minimum hold times was required to eliminate bacteria. Lower pH levels are necessary to prevent harmful bacteria. 3.5 or higher pH is best and what Dramm does. Ask that board allows 3 pH or lower in fish solutions. Q: What acid to you use to bring it down? And you said you use fish scraps? Do you use wild fish scraps? A: Majority of acid is food grade phosphoric acid or sulfuric acid. Using scrap fish from Great Lakes commercial fishing fleet, after parts for human consumption are removed. No wild caught fish used. Q: Is the phosphoric acid a significant phosphorus source in the final product? A: It’s mostly from the bone; not a significant part, but it does contribute. Q: Clarify the process you have and what you mean by lower pH during the process? A: We would rather have it at 3.5 at the end, but studies show it requires a stronger acid to properly produce – so keeping the acidity at the 3.5 pH throughout the process is not tenable. They would prefer to have the product go lower in pH while processing, though ending up at 3.5 pH would be do-able. Q: Why don’t you use whole fish? A: The ethics are the issue. We are trying to divert a potential waste stream in the Midwest. We do get some invasive carp occasionally, but we are not interested in catching wild fish just to make fertilizer. Other companies DO harvest wild fish just for fertilizer. Q: You talk about hydrolysate and emulsion? A: We make hydrolysate product; we grind them up. The enzymes naturally in the fish help break it down. Emulsions usually heat it up b/c they want to extract oils for consumption, some remove bone for bone meal, what you are left with is a concentrated higher nitrogen, lower phosphorus product. This is a different end product than the hydrolysis. Focused on proteins in food ingredients. The challenges of securing organic tamarind seed for tamarind seed gum. The gum is made from the seed, which is an underused byproduct. The gum is used for paper binding and as a food additive. Thailand and India are source. Food additive industry is too small to have separate roasting and grinding industries. Often the trees are wild. Organic pods can’t make organic seed gum, b/c there is no industry for the organic pods and the seeds are a small portion of that. Tamarind seed gum is used as a substitute for other ingredients. Q: Have you tried to work with growers you are currently working with to see if they will get certified? A: We have contacted them and they say it’s unavailable. In Thailand, the trees just naturally grow wild, and people pick them as a side job; in India, the seeds are mainly collected for the textile industry. Q: The database shows some organic tamarind, so why can’t you source it there? A: There is organic tamarind powder and pulp, but not organic tamarind seed from my search. We would be open to it if the seeds were of the right quality. Certified by OCIA and speaking on his own behalf regarding paper pots. In the past, he used cardboard and paper for weed control and the materials are similar. They use paper pots to plant huge amounts of salad mix starts. They should complete a full technical review of paper pots; farmers that have been allowed to use the paper pots should be allowed to continue to use them while they are under review. He may not re-certify all or part of his farm if he can’t use the paper pots. He notes this is sad because he is very dedicated. Q: Do you use paper in any other way on your farm? A: I do not. I grow my own mulches now, etc. Q: the decision to sacrifice your certification is an extreme one; can you identify one or two constraints that make the loss of this tool so important? A: In Boulder, Colorado. We are rapidly gentrifying, and labor costs are one of the biggest problems. Q: So economic reasons are the major reason? A: Large component; also, these soils are very challenging. I can transplant a start very rapidly, so there is a head start on weed management which is also a challenge. Labor and weed pressure. Q: Agronomic and economic. I understand. Q: Our current limitation is the petition was added on too late to get a proposal ready for this meeting. Maker of collagen gel for food industry, skin for sausages. Food safety of collagen gel skin is unparalleled and is of the highest standard. Precedent set by including processed intestines on the organic list. Gelatin is derived from numerous collagen courses of animals. Strong consideration should be given to collagen gel for being allowed; please consider during 2019 spring meeting. Q: Significant barriers you talk about – are you talking about single-animal casings? Is there an issue of quantity to use the casings currently available on the list? A: Twofold: single species issues, but moreso based on traditional sausage making issues or different types of equipment used to make the sausage. Collagen gel requires a specific type of equipment – the gel and meat are extruded at the same time. Not issue of quantity available, but preference. Food & Water Watch is also a member of NOC. 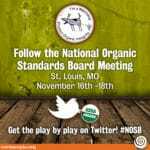 They signed on to add energy infrastructure impacts on organics to the NOSB agenda. If organic or other agricultural land is the source of drilling or natural gas, there can be serious impacts to the certification of the land. There are many opportunities to conflict with safe agriculture. Certifiers need to be aware of this so folks can protect themselves; we also need to raise awareness of this impact. Fully in support of this conversation starting. Support focusing on acreage data collection – important part of understanding organic industry. Important to protect from fraud. Having NOP be able to investigate surges in imports is also vital. The standards themselves are an important part of having NOP power – we urge you to take a look at livestock standards again. We support the petition to add collagen gel to the national list. We hope that the TR that is underway will show the Board this comment is accurate. Marketplace demand for organic collagen gel sausages: fully cooked sausage category has transitioned to collagen casings, now nearly half of category. There is a preference. The recipe ingredients for filling are available organic. 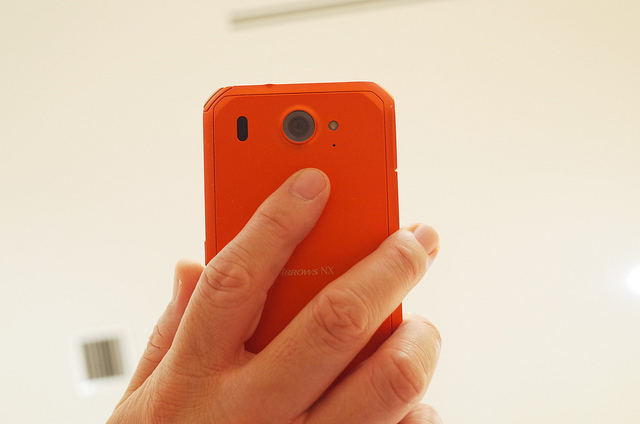 The casing could be made from a single source. Q: Are there more opportunities for single-species products w/ collagen gel? Kosher issues? A: I believe there is. Kosher products in this category are usually cellulose, for there is no casing involved. But it is possible to create Kosher casing. Yes, that is an additional aspect to the market that would be made available. Attorney commenting on Silver Dihydrogen citrate (SDC). Reasonable certainty of no harm to human health or the environment. It has been reviewed by FDA and EPA for safety (reviewed as pesticide). Both reviewed and said that SDC is safe for intended use. The information provided to the FDA and EPA was comprehensive. It provided data to show that SDC killed food-borne pathogens. They did their analysis using worst case assumptions. SDC is not nano-tech. Q: We have received info from others that SDC will break down into nanoparticles when in use. A: Some of our written comments address this. From technical aspect, the representative from Pure Bioscience will better describe this. Short answer is no, however, it does not breakdown into anything further than it is. Q: What about other comment to growing resistance to the silver compounds? Specifically limiting it to medical situations. A: SDC uses a very low level of silver to achieve antimicrobial effect. The benefits from using SDC and reduction in foodborne illness would instead reduce resistance, with fewer people going to doctors to get medication. Need post-harvest rinse of organic products for the production of pickles and sauerkraut. Depend on naturally occurring lactic acid for fermentation, but this also provides ideal environment for spoilage yeast. Natamycin is produced with non-GMO organic inputs and will kill fungi without killing the bacteria needed for our washes. Veggies uptake very little natamycin from the wash and the finished product has basically none left. Safe for human consumption within defined limits. Natamycin is a tool that will allow for positive and safe health outcomes of fermented food products. Q: Are there other materials that are alternatives on the National List or are natural and don’t need to be on the National List? A: There are some, but none show the same efficacy. Products that contain mustard oil, for example, sometimes add undesirable flavors that natamycin does not have. Q: How much loss do we have in fruit due to the lack of natamycin? A: I can only really observe inputs to the fermented food business. I’ve lost entire batches before, about 12 tons, due to issues with spoilage yeast. Many colleagues have reverted back to pasteurization instead of live culture foods because of the losses. Q: How many certified organic products comprise your line? A: At present, one product line is certified organic out of 10 products. Reluctant to offer more organic products because the spoilage yeast issue drives the price out of reach of the average consumer. Otherwise would offer more organic products. Professor of microbiology and plant pathology. Independent advocate for fungicide natamycin, not actually affiliated with DSM & Pace. It’s been in food industry as a preservative of meat and dairy for 50 years. It is a brand new fungicide for agricultural use in the last two years, registered with EPA. Registered as bio-pesticide, natural fermentation product. No bacterial killing bacteria. It only kills certain fungi. His interest is in post-harvest fungicide: worked with natamycin since 2012 and found it to be very effective. There has not been any reported resistance in fungi this attacks. It’s a major advancement and is registered as a conventional fungicide. Has multiple uses. Q: Is there any way consumers would know it had been used on the fruit they would be eating? A: Most packers list what treatments have been used on the packers. Q: One of our concerns is its use on livestock and its use in human health. We have concerns of resistance with candida for human health products. A: There is no resistance to filamentus fungi, candida is a yeast. Most of those reports come from labs that are trying to create resistance for study. Support relisting of sodium carbonate peroxyhydrate (SCP) as an algaecide and alternative to copper. SCP is an effective algaecide. Many studies, references, and reports support this that have not been read by the NOSB. The discussion document says SCP is not widely used, but that’s not true. Many farmers may not recognize they are using SCP because they only recognize the brand names. This is a better alternative than copper sulfate – you cannot judge it based on the number of comments received. Professor of microbiology. Pure Bioscience supporter for silver dihydrogen citrate product. Address issue of silver resistance. Spans 70 years of research, more in the last 20 years due to the expanding use of silver. Ionic silver attractive as antimicrobial because it is broad spectrum (bacteria, virus, fungi). Silver stacks many parts of the cell in microorganisms. Resistance of silver is fairly difficult for organisms to achieve because of that. It’s expensive for the cell to pump silver out of the cell, making resistance transient. This product is combined with citrate, which makes it enter the microorganisms better because it looks like food to the microorganisms. So it’s safe, can be delivered at low level of silver. This correlates with e-flux pumping in silver. For ionic silver, silver goes into the cell which is different than nanosilver. 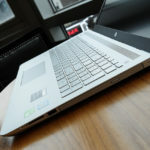 Q: Can you speak to nanosilver comments we’ve received, saying it will break down into nanosilver? A: I don’t believe that’s accurate. Nano is aggregate silver, unbound ionic silver will bind together and create small products. The citrate binds it and prevents this. Q: If the response of the organism is to pump out the silver, what is the fate of the silver that is excreted? A: It remains outside or can be pumped back into the cell. Because it’s a stabilized product, you use so little of it, it falls way below standards you would usually find in effluent/water. Low level as determined by EPA levels. Vanguard Global Assoc. consulting firm, board-certified toxicologist. Presenting on the use of SDC product (silver product he calls it silver citrate). Urges board to approve silver citrate. The NOSB recommendation to limit silver citrate to a certain particle size won’t work. Silver citrate contains ionic silver that is not defined as nano particles. No medical articles showed that silver exposure promoted resistance issues with silver. Q: We use criteria laid out in OFPA for inclusion on the National List. There are human and environmental risks and compatibility issues with this product. Adding this annotation for particle size would not work, you say. Why? A: You’re adding a criterion that no longer describes the petitioned product. The product contains silver ions – they are SMALLER than nano particles. That’s why the annotation won’t work. Silver is, like free calcium or copper ion (already approved), really soluble with citrate for disinfectant action. They may agglutinate into bigger particles, but so could the other ions allowed on the National List. Q: If the silver is an ion from the cell, separate from the citrate at that point, why can’t they pump it out as an ion? A: As with all ions, there is an association between ion and cat-ions. Citrate will bond 3 silver ions. The citrate will dissolve in the cell. When the silver ion leaves citrate, it binds cellular molecules and stops cellular actions, which is how it functions as an antimicrobial. You won’t have many silver ions re-associating with other silver ions. Highly unlikely that once it’s bound inside the cell it will be released, but it could be bound in neighboring cells or nearby vegetable cells. But this is still all within safe limits. Q: So the fate of the silver is contingent on the single cell organisms it’s killing? A: Yes. And FDA approval has an environmental impact assessment regarding this issue. Silver burden in environment is addressed by FDA in their impact statement (and his written comments). Q: You said lack of approval will lead to approval of other silver materials, and uses outside compliance. What do you mean? A: There are many silver products that are approved by FDA. The NOSB may inadvertently approve other disinfectants that apply with this annotation. If other silver products are approved, the particle size annotation is still an issue. (Commenter difficult to hear.) Comment on organic seed guidance – ask to verify how different organic farmers acquire their seed. ASTA supports chain of a minimum of five sources. Embryo rescue or double haploid method should not be considered excluded methods. Seed quality is important. Q: Transparency for growers is important. When the seed companies do not provide farmers with info on the presence of genetic engineering in the seed, it should not be their fault if their fields are contaminated, correct? But what should be done if there is a detected contamination? How do we deal with that if we don’t have testing and transparency? A: Growers should be able to look at purity of existing seeds. Genetic purity should be tracked. Growers are asking for tests and are receiving that transparency. (Commenter difficult to hear.) Owner of small company. Concerned because French market does not believe U.S. products are organic. Our job has been to introduce some organic products from the U.S. to France. Q/comment: U.S./EU equivalency does exist. We are not a promotion board to promote products.